Random House Books for Young Readers, 9781524719524, 40pp. Celebrate the fiftieth anniversary of the Stonewall Uprising with the very first picture book to tell of its historic and inspiring role in the gay civil rights movement. 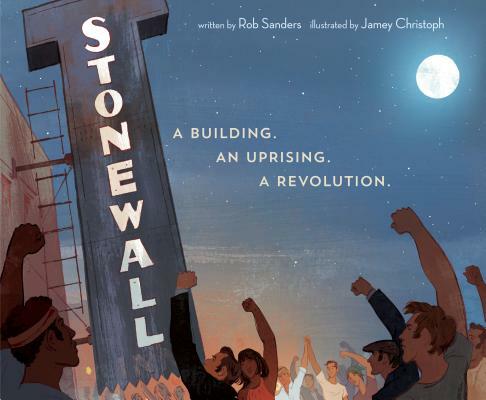 From Rob Sanders, author of the acclaimed Pride: The Story of Harvey Milk and the Rainbow Flag, comes this powerful and timeless true story that will allow young readers to discover the rich and dynamic history of the Stonewall Inn and its role in the LGBTQ+ civil rights movement--a movement that continues to this very day. In the early-morning hours of June 28, 1969, the Stonewall Inn was raided by police in New York City. Though the inn had been raided before, that night would be different. It would be the night when empowered members of the LGBTQ+ community--in and around the Stonewall Inn--began to protest and demand their equal rights as citizens of the United States. Movingly narrated by the Stonewall Inn itself, and featuring stirring and dynamic illustrations, Stonewall: A Building. An Uprising. A Revolution is an essential and empowering civil rights story that every child deserves to hear. PRAISE FOR PRIDE: THE STORY OF HARVEY MILK AND THE RAINBOW FLAG! "This children's book about gay Pride should be in every school." "I couldn't be more thrilled the world now has this book." ROB SANDERS is a writer who teaches and a teacher who writes. He is the author of Crystal Kite Award Winner Outer Space Bedtime Race, Cowboy Christmas, Ruby Rose: Off to School She Goes!, Ruby Rose: Big Bravos!, Rodzilla, and Pride: The Story of Harvey Milk and the Rainbow Flag. Rob lives in Florida, where he teaches elementary school. Visit him at robsanderswrites.com. JAMEY CHRISTOPH has created illustrations that have appeared in the New York Times and the San Francisco Chronicle, and has received distinguished recognition from the Society of Illustrators for his work on Gordon Parks: How the Photographer Captured Black and White America. Jamey lives in Ohio with his partner and two dogs.